Welcome back everyone! We are SO happy you've stopped by to play along with us again this week. We have a great challenge for you again this week, and we're SO excited to see all the fabulous projects you share with us. Let's get right to it. Before we get into this week's scripture verse, I'd like to share the verse that comes just before it. It really helps us understand the man being described in our focus verse. Jeremiah 17:7 says, "Blessed is the man that trusteh in the LORD; and whose hope the LORD is". So, before we hear his description, we understand that this man TRUSTS GOD, and places his complete hope in the Lord. 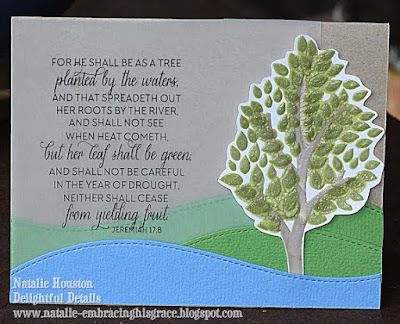 Then, our focus verse goes on to say, "For he shall be as a tree planted by the waters, and that spreadeth out her roots by the river, and shall not see when heat cometh, but her leaf shall be green; and shall not be careful in the year of drought, neither shall cease from yielding fruit." It is saying that the man (person) who first places his trust and hope in God, will be likened unto a tree that is planted by the water. We know that a tree (or a plant, or a person) needs water to grow, so being planted near water is a real benefit. Then, it tells us that this tree (man) will spread out his roots by the river (meaning that this man will raise his family near the water). This refers to the church (whether a traditional church or a home church, it is a place where the family (this man's roots) can be properly watered so that they can grow spiritually. It also tells us that this man will not see when heat comes. That simply means that when times get rough (the world "turns up the heat"), the man who is trusting in God doesn't need to worry because he knows that God has everything under control. Next, it tells us that this man's leaves will be green. We touched on this last week; explaining that when we raise our children for the Lord, they will "be green" (they will reflect God's glory, walk in integrity and truth, be obedient, happy and blessed). 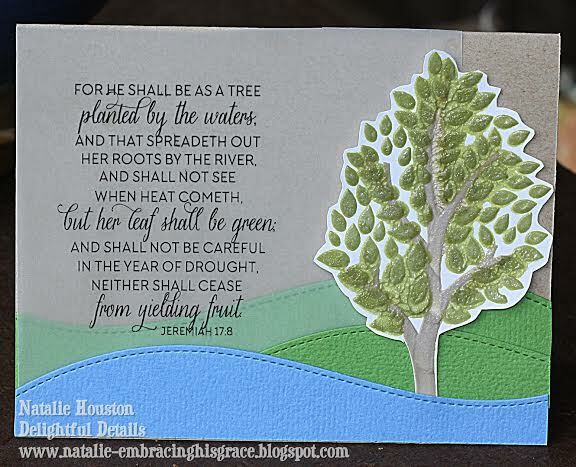 Then, it says that the man who is trusting and hoping in the Lord, and is living continually near his source of water (growing spiritually), doesn't need to "be careful" or worry during times of drought. This is talking about times of financial difficulty, health issues, or ANY hurdle the world may throw his way. This man doesn't have to hide the water (or his money, etc.) away and hoard it during these times. 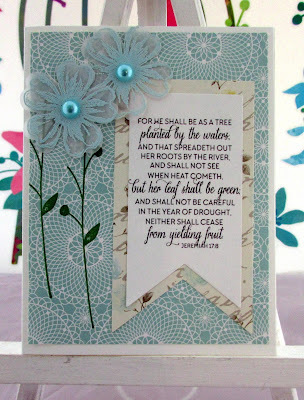 It says that this man can continue on during difficult times because he KNOWS that the Lord has everything under control; and this man can even have more children during the drought (difficult times) because he hopes in the Lord, and knows that the drought will pass. Let me tell you, dear friends, our world is in a serious time of drought right now. These are difficult times, and getting even more difficult as the days, months and years go by. But as Christians, we don't have to worry about any of this. We can be the man who trusts and hopes in the Lord, and is planted by the water, and who spreads out his roots, doesn't need to worry during the drought, and can continue doing what God has called him to do; completely knowing how it all ends, and rejoicing in it all. NOTHING can, or should, EVER shake the Christian. Our future is CERTAIN. It's the future of the ones working so hard to shake us that we need to concern ourselves with, and pray for. There are so many lost souls out there. God knows who will be saved and who will not. It's simply our job to share God's love with as many people as we can, and to let the world know that they don't have to freak out as our world comes to its difficult end. The answers are all in Jesus Christ. As mentioned, the very first part of this whole lesson was....."BLESSED IS THE MAN...." That's us! Please pray for, and share with all those you possibly can that they can also be that blessed man (woman, child, etc.) by simply coming to Jesus Christ, confessing their sinful condition, accepting His perfect sacrifice that He paid on the cross, and asking Him to be their Lord and Savior. And for the men (fathers, grandfathers, husbands, brothers, uncles, etc.) who live this blessed life, be sure to say THANK YOU to them because their lifestyle isn't popular today. But how wonderful to know that "BLESSED IS THE MAN......." who lives for Jesus Christ. As always, you are welcome to save this week's free scripture/word art file to your computer, but are not required to use it in order to play along in our challenges. We welcome you share your art with us; remembering that Anything Goes as long as it's family-friendly, and uses an encouraging or uplifting sentiment. 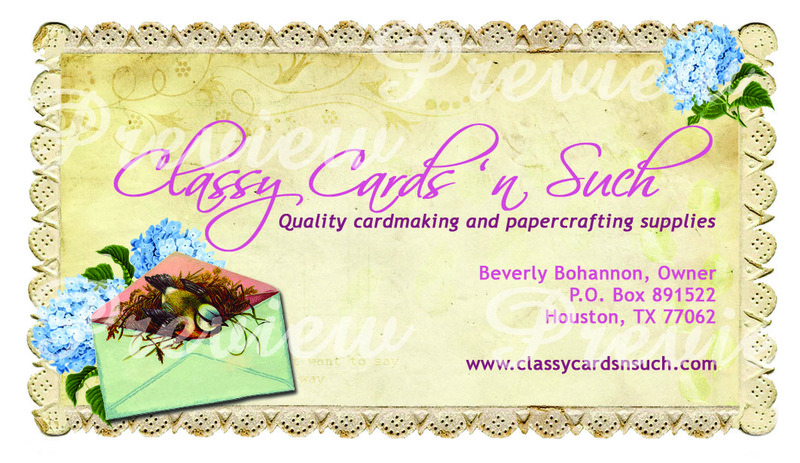 This includes any type of altered or digital art (not just limited to cards). 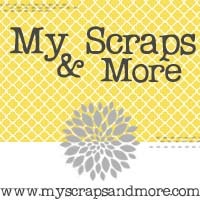 You may link up to five (5) projects each week. The more you enter, the more you increase your odds of winning. It is our desire that God's Word will be a blessing and encouragement to you each week. If you have any questions about the rules, be sure to read the complete list of rules under our page tab for "Challenge Rules". Because our ultimate goal is to honor God, we have no other choice but to delete any entries that do not adhere to our guidelines. Let us know if you have any questions, and thanks for your understanding and participation! 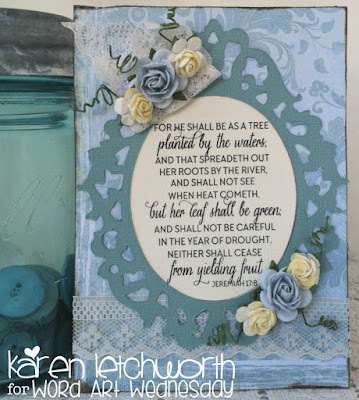 Here's this week's scripture/word art file. We hope it will be a blessing to you. the Classy Cards 'n Such Blog. and super sweet QKR Stampede. 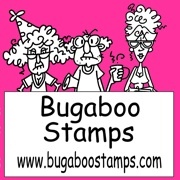 Enjoy your prize from Bugaboo Stamps. to claim your prize! Thanks. May God bless all our amazing sponsors. This is one of my all time favorite Scriptures, so I thank you for the beautiful download. All the samples are just lovely! Your cards are beautiful everyone. Thanks for sharing your talents and your loving hearts. Beautiful creations by the DT. Thank you for the challenge. Great devotional! But in the word art, why does it start out with "He" shall be like a tree... but then the rest of the pronouns are "her"? Oh Happy Dance today - I see I am winner - thank you so much - I sent you an email Karen to claim the prize - thanks to the DT for their inspiration and for the devotional and of course, for a new challenge - have a blessed day! 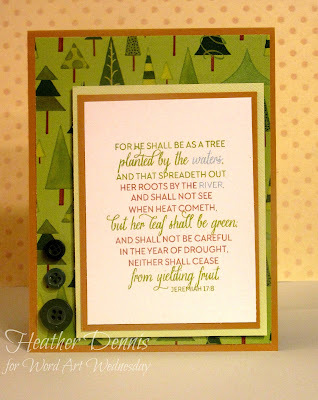 It's always a blessing to see the DT members beautiful work and weekly scriptural inspiration. Thank you! 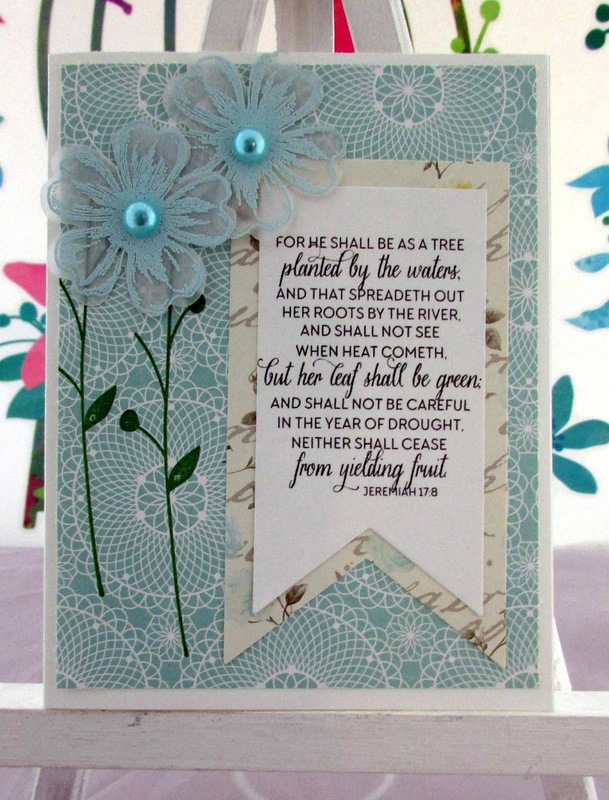 What a beautiful scripture! Thank you for the word art! 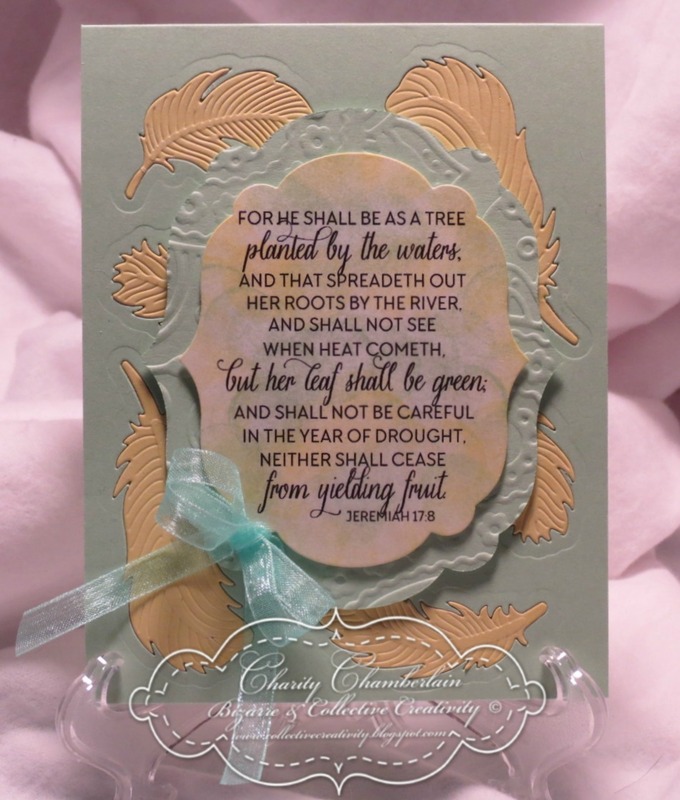 Your DT samples are particularly beautiful this week! Thank you another challenge - I do enjoy it here! Thank you for another challenge, verse and devotion. Lovely cards by the design team. We are so glad you are blessed with this week's Scripture and devotional. Crafty blessings abound... thank you for the inspiration and wonderful challenge. :o) Sending lots of love your way! Wonderful verse and beautiful words on the great riches in our Faith in the Lord Jesus..
FYI - Just in case anyone is interested in knowing, the question that was addressed earlier in the week as to "why in this verse it starts out by saying "he", and then switches to "she/her", this question was answered directly to the person who asked it. Rest assured, it was most definitely answered according to Biblical truth. Just for the record, this is how it was answered: It reads this way because this is the King James Version of the verse, which we believe is the best translation of the Bible. 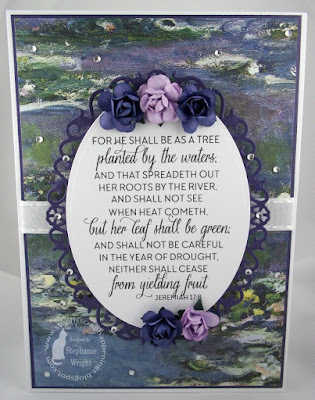 When the verse was translated for KJV from it's original text (either Greek or Hebrew), the word "he" is referring to the man (blessed is the man......for he.....), and the feminine later in the verse (she/her) is referring to the tree. In many languages (Spanish for example), all objects are assigned either a masculine or feminine prefix (i.e. el bano [bathroom is male for some reason in Spanish], and la pictura [picture is female], and so forth)...ALL objects in Spanish are assigned either male or female/masculine or feminine, and so this is most likely why the tree was referred to as female in translation. That is our teaching. Anything else that may have been posted in the comments are simply the thoughts or opinions of other people; and not necessarily those of the blog administration. I forgot to write back to say Thank you for answering my question. That makes sense to me! I'm normally a NASB girl (or ESV now that my journaling Bible is in that) but with all the Bible apps available, it's enlightening to read all the different translations. 165. Melissa L. here, I messed up the link to this post. Here is the correct/working link: https://honeybeelane.wordpress.com/2015/06/23/life-is-beautiful-big-cosmos-big-announcement/ So sorry about that!